How a Star Wars character got his name. It’s a little obscure, so if you’re not getting it: The guy’s name is Bib Fortuna. Welcome to my blog, which digs deep into topics such as ophthalmic pharmaceuticals, my kids, doodles, developing iPhone apps, and, starting today, . . . indoor plumbing! OK, I don't expect this to become a trend, but I had to replace about five Kohler Devonshire (model K-393-N4-BN) bathroom faucet valves in the last year. There was a little bit of a learning curve for a newbie plumber, and I found that I really had a hard time finding help online. So, I thought I'd write this post in hopes that someone doing a Google search for the right keywords stumbles upon it and, as a result, manages to avoid some of the same mistakes I did. Step one, of course, is turn off the water to the sink. Step two is to get the tops of the handles off. This is where I really struggled. If I felt around the back I could feel a little indentation that I assumed was for accessing a set screw, but none of my allen wrenches seemed to fit in there. Trying to turn a wrench was complicated due to the close proximity of the counter's backsplash. 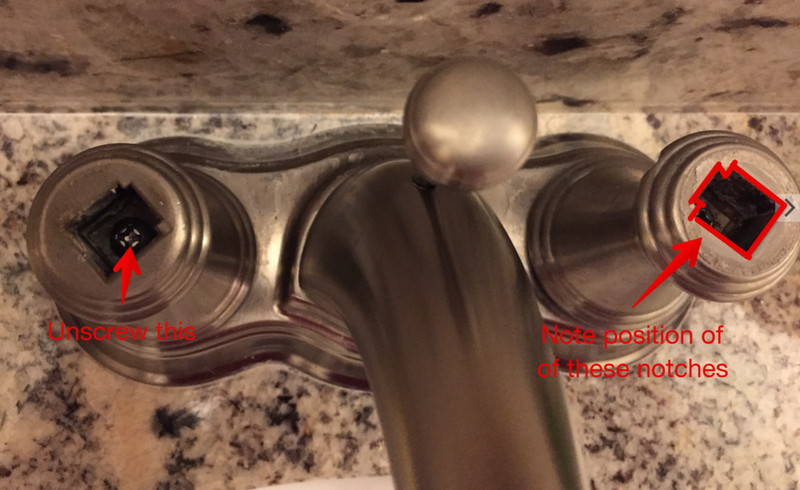 I did some Google searches for multiple variations of "kohler faucet handle remove" in an effort to see if there were any tricks to removing these handles, and most of them implied that they just twisted off (without a screw). So, I wrapped a handle in a cloth and gave it 10-16 foot pounds of torque, but no dice. I only managed to scratch the finish on the faucet. Bummer. Ultimately, I figured out that the set screw required a star shaped bit. Once I found my little socket wrench I was able to access the screw and work around the close backsplash. Once the tops of the handles are off, simply remove the screw to remove the base of the handles. But, before you do, take note of the position of the handles, and remember if the faucet was in the on or off (probably off) position when you removed the handles - this will save you some time later! Remove the valves with a socket wrench. These aren't supposed to be super tight but they were for me, which was complicated by my not knowing which direction I was supposed to be twisting them. It turns out they both needed to be turned counterclockwise. Replace the valves. There are two slightly different valves, and they're not interchangeable. One open by turning it clockwise, the other will open when turning it counterclockwise. One of my valves had red on the tip, which I assumed would be for the hot water. Makes sense, right? Well, it turns out I was wrong. Replace the handles. You might find you need to experiment with the handles positions a bit. I believe the valves are shipped in the "on" position, which confused me because I'd taken the sink apart in the "off" position. This, compounded with having switched the hot and cold valves caused me a lot of confusion. The handles were only turning away from (towards the wall) or the water would turn on in the "off" position and "off" in the on position. The bottom line is, I'd recommend placing everything into position without screwing anything, then turn the handles. Do the handles turn away from the wall? Next, turn on the water. Does the water flow when you pull the handles forward? Or does do the opposite? Once everything makes sense, screw the screws. Enjoy your new drip-free sink! This Mother's Day, while my wife straightened up and I reclined on the couch browsing Twitter, I happened to see an article ranking the top 10 science fiction mothers. On the front there was a picture of Linda Hamilton from Terminator 2, brandishing an automatic rifle and lookin' buff. At that very moment, my wife walked by carrying an armful of Nerf guns back to the kid's arsenal. Of course, Linda Hamilton in T2 is and my wife are different. Sara Connor prevents Armageddon by fighting a robot from the future, after all. However, my wife does battle midget terrorists on a daily basis. Terrorists that can operate an iPad but, paradoxically, can't figure out how to put a plate in a dishwasher. So, there a lot of similarities there too. And, I was just kidding about loafing on the couch while my wife was doing housework. I was actually on a chair. Take the screenshot (on a Mac pressing ⌘-shift-4 and dragging the crosshairs over your target will do the trick). Find the new image file on the desktop and double click it to open in the Preview app. Use Preview to resize the picture then save the file. On my website I display product images in a way that requires them to be no larger than 150px wide. However, I've been thinking a lot about retina screens lately and I've been starting to collect versions of my images that are twice as large too. Upload to my server using my FTP client (I use Transmit). This involves navigating about 6 layers deep into my file system. The point of these screenshots is to display them on my Web site, so the last step is to enter the image name into my database. So, I either have to retype the name I chose for this image or copy and paste it. Every step is simple. However, when you find yourself repeating a multistep task like this it's time to consider some sort of automation. There's even some absolutely fantastic third party apps like Hazel and Keyboard Maestro. However, a lot of workflow problems like this one can be solved by the simplest automation solution, Automator. Automator makes automation easy by letting you drag steps into your workflow. These steps are chained together, so each one takes an input (which can be a file, text, or something else) and outputs an, er, an output. Oftentimes this output is the same thing that was input, sometimes it's something different that was created by the step. Note: To quickly find these actions start typing their names into the search box at the top of the screen. Make sure Library is highlighted in the left column, otherwise you will only be searching a smaller subcategory and you might not find what you're looking for. So, this is the workflow that I ended up with. The first step is to take the screenshot. I want this to be interactive so that I'll be able to select the exact part of the screen that I want for my screenshot. The other option is to save it to the clipboard or to a location. I first made a folder on my desktop called eyedock lens image and put an image inside of it named new screenshot.png, then I chose the Other option in the Save To: dropdown and navigated to this image. One thing that I wanted to point out on here is that the steps you drag into automator are usually chained together, meaning that the output of one step is, by default, the input for the next step. This is indicated be the circle in the image above. However, sometimes we want to break this chain. This is true here. My second step is to ask for some text that will be a name for this picture, which is a step that does not need an image to be passed into it. So, when I added this step I right-clicked on it and chose the Ignore Input option. As you can see (where I put the red 'X' above) there is no visible connection between the steps. Asking for text will pot up a little dialog box that will ask for some text. I want this to be mandatory so I checked the Require an answer checkbox. The output of this step is going to be the text that the user types in, and this will become the input for the next step, which is Set value of Variable. I named my variable Name, so now this variable it will equal whatever text the user entered in the above step. After setting my variable, I chose the Copy to Clipboard step. This will put the name of my image file on the clipboard so I can just paste it where I want it. This may not be an important step for everyone but it's a helpful one for me. Rename Findere Items: Name Single Item. I'm going to rename the full name of the file, so I selected this option and then I used the variable NameI from our second step and appended the text "_original.png". So, if the user enters the text "myPicture" in step 2 then the file will now be named "myPicture_original.png". After renaming the file I'm going to set another variable that refers to this file. It's always best to make variable names that make sense, so I called this variable Original Image. Then, I duplicate the file. The output from this step will be the duplicated file (not the original), so my next step, Rename Finder Items, will rename this file (otherwise it well be called myPicture_original copy.png). I'm ultimately going to make two copies of this image and this one is going to be twice as big, so I will rename this one with the variable name + "@2x.png". In our example it will be myPicture@2x.png. Lastly, I set this to another variable and, trying to keep things organized, I call it 2xImage. I'm thinking, at this point, that these steps aren't requiring as much explanation. The "2x" file is duplicated, renamed (this time it will simply be myPicture.png), and stored to another variable (1xImage). In the next step we finally scale the image. For my Web site I place images in a position where I want them to be no larger than 150px, so I select the appropriate options to give that result. This scaling will be done in a way that respects the proportions of the image - it won't turn your image into a 150px x 150px square, it'll just make sure it's not larger than 150px in either dimension. We created a 2x image, but we haven't scaled it to our desired size yet. So, we're going to get that image and do that now. This is why we assigned a variable to that image earlier - it makes it really easy to retrieve and perform more actions on it. So, our next step is to Get the value of variable "2xImage". Note that I once again selected the "ignore input" option so this step wasn't chained to the ones above it. Then, we scale the image - I wanted this to be twice as big so I selected 300px this time. Now, all the images I wanted have been created - the original, the 1x, and the 2x. The last step is to upload them. Unfortunately Automator doesn't have any built in steps to upload files, but any good third party app should provide Automator actions. As I mentioned above I use Transmit and it provides exactly what I need for this step. So, the next step is to drag in the Upload step and configure it with your server credentials. After I've uploaded the 2x image, I get the 1x image (via the 1xImage variable) and upload that one too. Now save the app and name it whatever you want - choose something that make sense, like screenshot uploader. You can activate it like you would any other app (by double clicking it). However, if our goal is to increase efficiency, I'd use an app launcher like Spotlight (hit ⌘-space and start typing screenshot uploader, or whatever you named it). I'd also recommend giving your app a custom icon to make it more recognizable (otherwise all your Automator apps will look the same!). There's about a 97.6% chance that you don't need the exact same thing that I need here. Hopefully you'll find this helpful, though, and take this and customize it for your own needs. Automator is obviously highly customizable, and there's no right or wrong way to solve a problem. In fact, as I typed this up I thought of a couple ways this workflow could be changed to work more efficiently. This is one more way that Automator is like "real" programming: Job one is making something that works, jobs 2 through 99 are refining what you've done - if you're so inclined! Just don't go overboard - it's easy to do, as this xkcd comic sums this up perfectly! There is one issue I don't like about this workflow. It isn't very smart. If an image is smaller than 300px, or 150px, it will still try to create images in those sizes. As a consequence a 100px image will be blown up to 150px and 300px and, when you're blowing up images like this, they'll be blurry. This is an issue that could be addressed by writing a script (Applescript or otherwise), but this is beyond the scope of this today's blog post. One other thing to consider - this script keeps three images on your hard drive (the original, the 1x and the 2x). You may or may not want this. If not, consider customizing it yourself by adding some actions to delete the files after the upload. Well, I'm going to compete in a Crossfit competition in one week! God help me! My coaches and teammates (PFD Crossfit - check 'em out!) have been incredibly supportive. In theory, I was a college athlete: I ran track at tiny Ripon College, who's biggest claim to fame is the fact that Han Solo went there. One of the other noteworthy thing about Ripon was that it was the location of the Rippin' Good Cookie factory. Oftentimes long distance runners on the team would run to said factory and bring back a bag full of cookies for the team to snack on after track practice. So, needless to say, I never developed the best pre-competition dietary rituals so I'm learning as I go. My coach Chris gave me a Word document full concepts like macronutrients and glycogen storage process. I've read through this a few times and I thought I'd share the main points with you here. Water is the a critical factor in the glycogen storage process. The body needs water in order to store glycogen in the muscles and the liver. Digestion is king. You want to look to foods that are EASILY digested by the body. Digestion takes a lot of energy, and the last thing you want to do when you’re staring a competition in the face is thwart valuable energy to a bodily process like digestion. For example, rather than a whole banana or whole yam, use baby food variations of these items in the pre comp/intra comp protocols. Every piece of food that’s consumed first think about how easily it can be digested then transported effectively. Or you could do this . . .
Get lots of sleep. The week before the competition start getting 45 minutes more sleep than normal. I wrote about this in more detail in a blog post, but I wanted to share an update I made to EyeDock's oblique crossed cylinders calculator. It still does the calculation the same (optical fundamentals don't change, after all), but you can now specify which lens you're using as a trial. This does not affect the calculation. However, it does allow my program to use EyeDock's contact lens database to let you know the closest set of parameters to the calculated result. So, it will round to the closest sphere power, cylinder power, and axis, all while doing smart things like maintaining spherical equivalent, etc. Here's a little video explaining the calculator and this new feature. One does not become a professional lawn mower overnight. All kids dream of the bright lights, the glory, the big contracts, but few are willing to put forth the effort required to make it to the big time. You don't have to start at a young age, but it helps. Take Aiden, for example. He started training at two years old and has already logged more hours than many people 10 times his age. 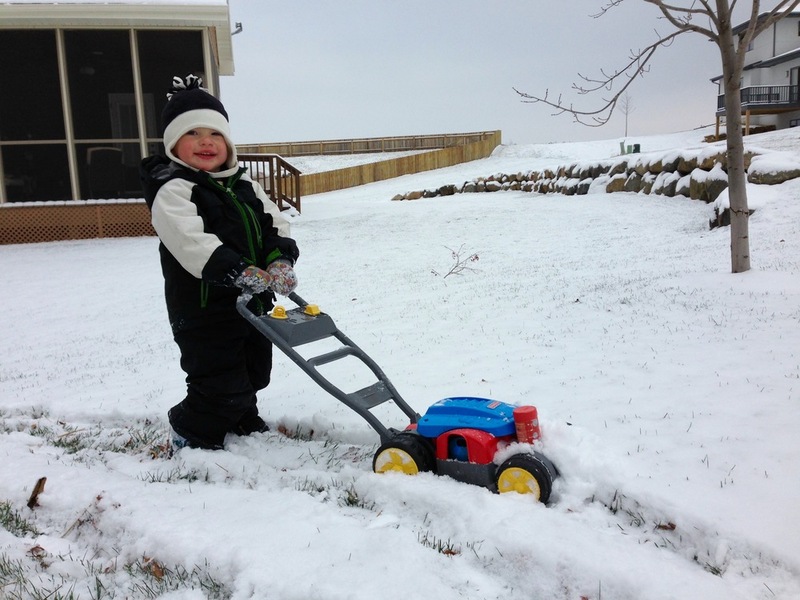 His chances of making a traveling mowing team by age four are quite good. There, he'll refine his skills by competing against the best of the best and, by the time he's 18, should snag a lawn mowing scholarship to a top university program. And, with hard work, dedication, and a little luck - such as avoiding any career ending injuries - perhaps Aiden will be drafted by a pro team some day. Of course, going pro is a whole other level, but, in the right system complete with veteran leadership, good coaching, lots of film study, I'm convinced my boy could be a star. And hopefully he'll buy me a new house. Or at least pay off my school loans. Check out the gallery below to see some of AIden's training techniques. To be the best you need to challenge yourself. Only the weak stop training in the Winter. 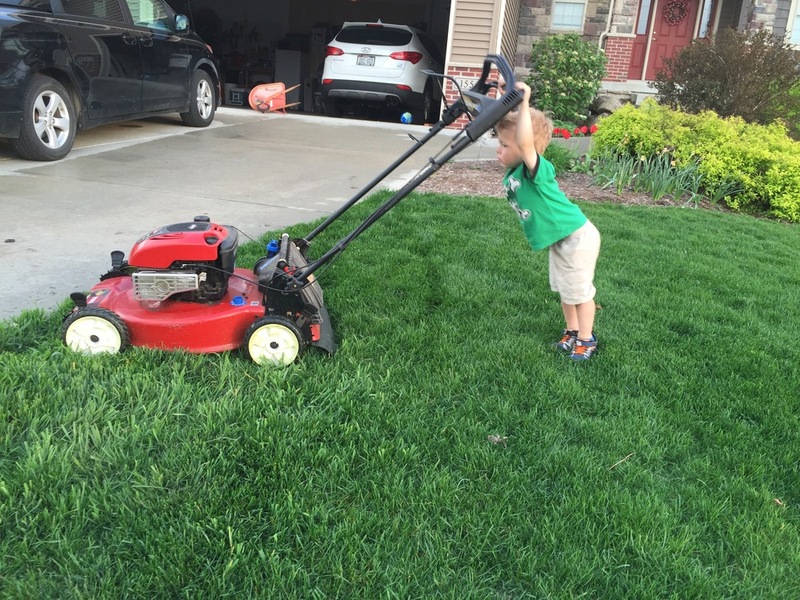 The best lawn mowers have an intimate knowledge of their machines. Sun up to sun down. Wearing the right gear is important. And, lastly, a video illustrating his dedication to his craft.